The exciting news from space keeps coming – this week researchers announced the discovery of an “Earth-like planet” called Kepler-452b. The new planet, discovered by researchers using NASA’s Kepler space telescope, orbits a sun-like star at about the same distance that Earth orbits the sun. NASA’s Jon Jenkins says that it’s the nearest thing to another Earth-sun twin system that scientists have found. The Kepler team’s observations indicate that Kepler-452b may be rocky like Earth, and that it is about 6 billion years old, 1.5 billion years older than Earth, and 60 percent larger in diameter. Its star, Kepler 452, is also older, bigger and brighter than our sun. One especially interesting finding: geologists believe that, if the planet is rocky, its gravity would be about twice that of Earth’s. 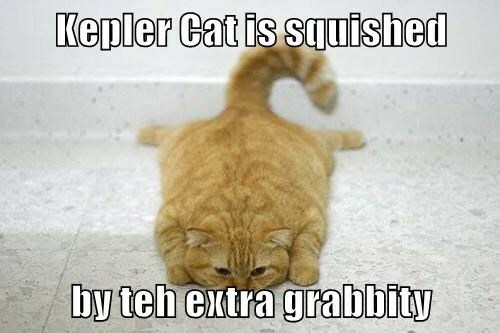 This might make it difficult for humans to explore, but be perfect for cats, for whom, as we know, gravity is optional.